WHAT IS SLEEP DISORDER ? Sleep disorders is a condition which affects how much and how well one sleeps. The causes for sleep disorder are many and include poor daily habits and some medical problems that disrupt the sleep cycle. The first thing you notice when you have sleep disorder is that you feel fatigued when you get up in the morning. If you don’t feel rested then there is a serious problem for which you should consult your doctor. Dangers of sleep disorder include lack of sleep and the subsequent effect on your life. Sleep deprivation leads to accidents, relationship problems, poor performance at job, and injuries at work-place, memory problems, mood swings, weight gain and many other medical problems. It is also known that sleep disorders lead to heart diseases, obesity and diabetes. 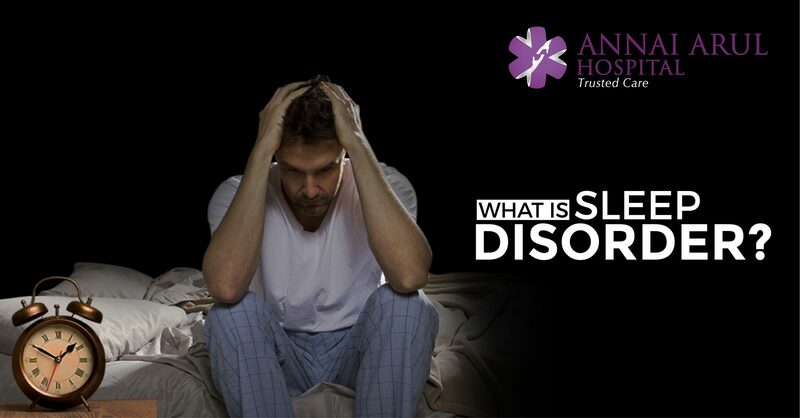 Sleep disorders are of many types and the symptoms depend on the type or disorder. Difficulty in falling asleep or staying awake or disturbed sleep. The amount of sleep one requires is determined by our age. Infants need anywhere between 12-15 hours, toddlers need from 11-14 hours, preschoolers between 10-13 hours, school children 9-11 hours, teens 8-10 hours and adults require anywhere between 7-8 hours. If you lie awake at night for hours together and wake up early, while not being able to drift into sleep again or do you wake up repeatedly at night? Then you may be suffering from insomnia. Insomnia is a common disorder that grips most adults. If you drink coffee in the afternoon or in the evenings or if you smoke or eat heavy food before going to bed, it has an example of bad sleep hygiene. Some people go to bed at different time each night or fall asleep with the television on these are also counted as bad sleep hygiene. So keep your sleep habits clean and sleep inducing. Sleep disorder leads to many health problems and some are life taking, so you have to keep yourself sleep healthy to avoid such ailments. Sleep disorders can lead to arthritis, heartburn, chronic pain, asthma, heart failure, thyroid problems, weight gain, work performance, neurological disorders like stroke, Alzheimer’s and Parkinson’s. Insomnia is a common problem among pregnant women especially in the first and third trimesters. Another reason for sleep disorders could be menopause in women. Age is another factor where men and women get sleep disorder after the age of 65. Yet another cause of sleep problem is frequent flying and shift work where the circadian rhythm is disrupted. Where the internal body clock malfunctions there you have sleep problems. Also insomnia can be a presenting symptoms of an underlying psychiatric disorder. Eg. Depression, anxiety disorder, substance abuse, etc.